Elephant tusks, a shrunken head and, just off to the left, skulls on pikes. Publicity still of three actors (l to r: Adele August, Steve Rowland, and Kathleen Case), but someone has colorized the black and white image. Because the theme was not geographically-specific, decorating Goff's mix of indigenous and colonial architecture was challenging. Luckily for him, interest the Pacific Islands was at a peak in the United States following World War II. 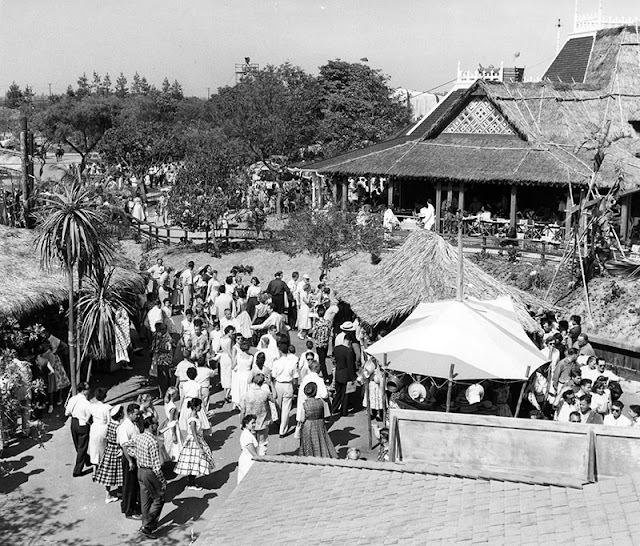 James Michener's novel Tales of the South Pacific inspired Rodgers and Hammerstein to write their musical South Pacific, tourism in the U. S. Hawaiian Islands was booming, and veterans of places like New Caledonia and Tulagi were opening what came to be known as tiki bars. Harper Goff's original shop architecture was more Farmer's Market than tiki bar. 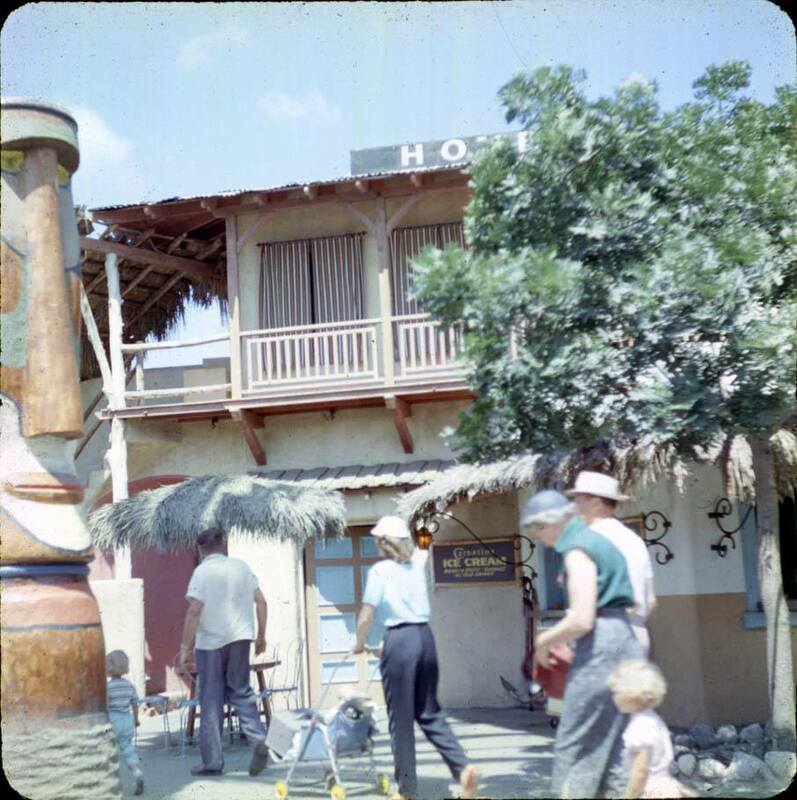 Ernest Gantt arguably created the first tiki bar when he opened Don the Beachcomber in Los Angeles in the midst of the Great Depression. His chain of island-themed restaurants became so popular, Gantt changed his name to Donn Beach. 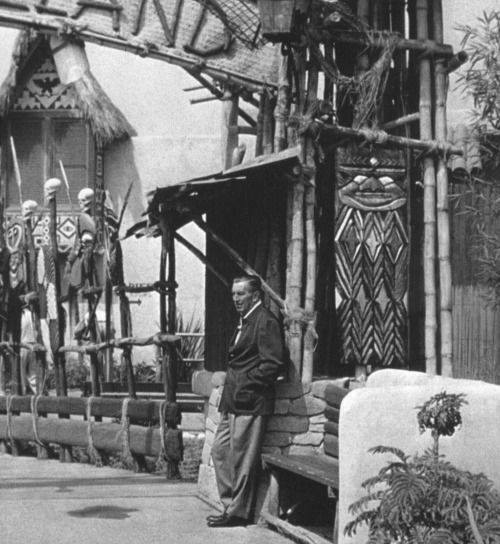 Victor Bergeron opened Trader Vic's in Oakland three years later, and both were thriving before Walt Disney released Snow White and the Seven Dwarfs. In West Los Angeles, I grew up near Tom Kelley and Jack Bouck's Kelbo's on Pico Boulevard--tiki bars were everywhere. Tiki decor and Adventureland were inseparable. The genre had already appropriated West Indian concepts like voodoo and calypso to add to the Polynesian motif. Coconut husks, palm fronds, tiki gods, bamboo, fish nets, woven thatch, spears, huts, masks, pineapples, ukuleles, glass balls, luaus, carved wooden shields, grass skirts, elephant tusks, totems, driftwood, shrunken heads and skulls, alongside colonial artifacts such as shipping crates, jeeps, pulleys and rigging, pith helmets, corrugated metal, and other items imported from civilization. Even paper lanterns and Chinese designs could be considered "exotic." Hand-lettering suggests the third world. 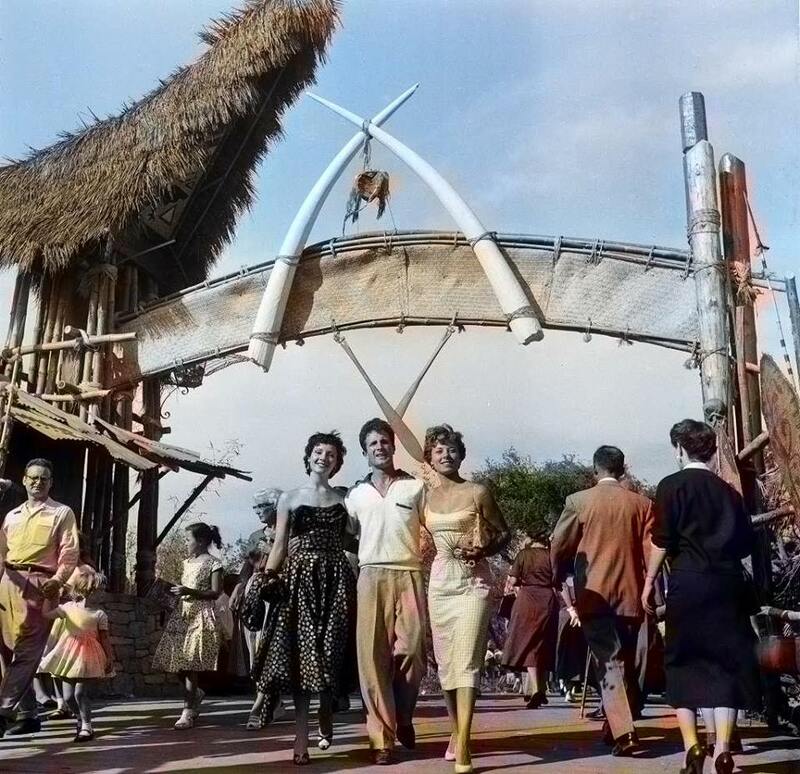 Photo, from the Daveland collection, was reportedly taken on opening day, July 18, 1955. The heroes of this story are LeRoy Schmaltz and his friend Bob Van Oosting, two young guys who were just starting to build a reputation as providers of tiki decor. They were based in Whittier, not far from the Disneyland site in Anaheim. Schmaltz studied art, Van Oosting was a business major. Together, they went on buying and research trips to places like Tahiti, Fiji, and New Guinea. Back in LA, LeRoy used a chain saw to create tiki art of his own design. Converting a log into a tiki can take a week if it's seven feet high, he told the Los Angeles Times. 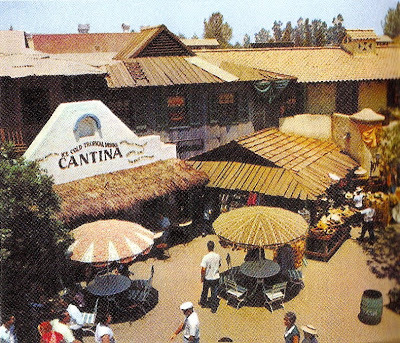 A tiki, probably designed by LeRoy Schmaltz, stands guard near the Cantina. 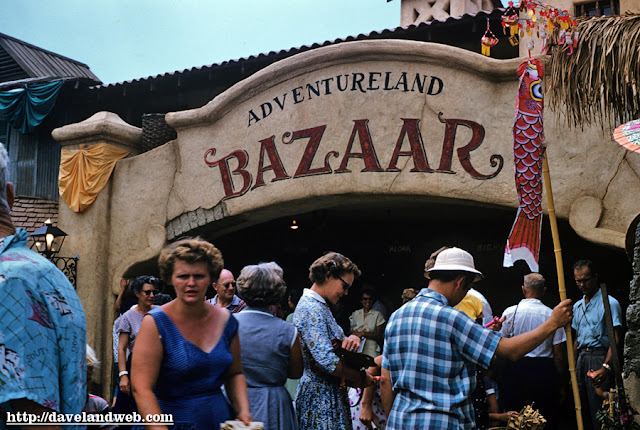 Goff found the pair and effectively monopolized their output in 1955 to give Adventureland its rich look. The next year, their company, Oceanic Arts, broadened its customer base. Dave DeCaro, of the Daveland site, reports that Robert H. Carter did much of the actual wood carving for Aventureland. LeRoy Schmaltz, now recognized as a "tiki god" himself, cautions against assuming that his designs are authentic. 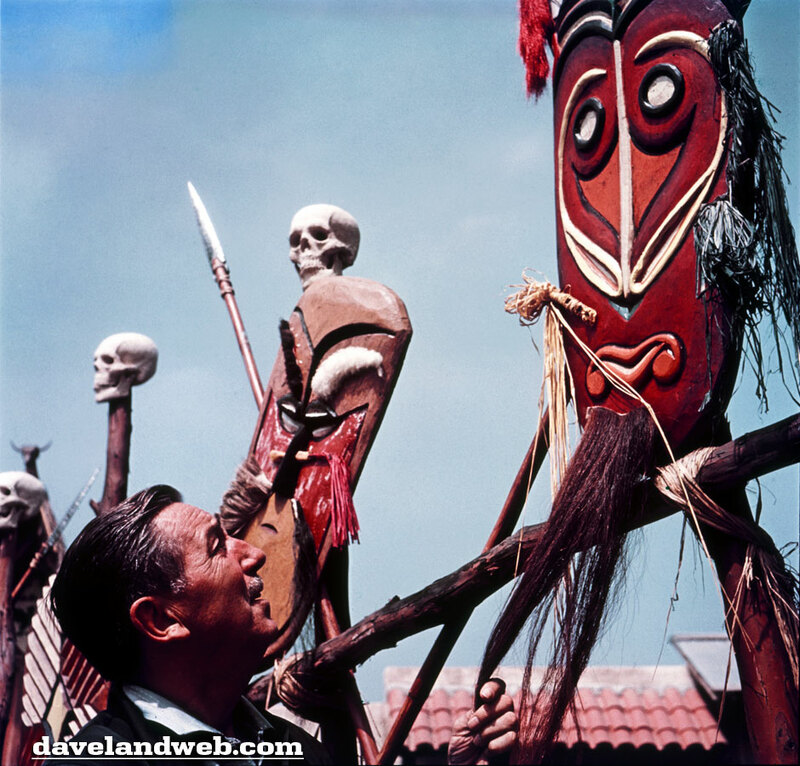 "They have a Polynesian flair, but they are imagination, fantasy," he explains.